Usnavi runs a small bodega in Washington Heights, the (very) upper-West Side district in New York City. His store is a focus point for his community, drawn to Manhattan from across Latin America. Usnavi has two ambitions, to return to his native Dominican Republic and to marry his beloved Vanessa. He lives a bohemian life shared with a cast of vibrant characters, his family, his friends, his customers, his neighbours – but change is in the air. We enter to find that Sergeant Pepper has moved to Sesame Street. The brownstone shopfronts and stoops are characterful and real. They are offset with an interplay of glorious technicolour rainbows and abstracted geometrical shapes which conjure up images of NYC’s metro map. Not since the art deco glory of a parallel biopic of Coward and Novello at the 2012 Fringe have I so achingly wanted to inhabit a set. As is known to anyone who has felt the wind rushing up his kilt at a rooftop Brooklyn wedding; as anyone will attest who has watched the the sun set over Astoria with a tumbler of Caol Ila in hand; the most important feature of the Manhattan skyline is the sky. It is a vast and magnificent canopy. How incredible it is then that this unequalled canvas, spread across the greatest metropolis there ever is or was, has been recreated in the dignified intimacy of Morningside’s Churchill Theatre. On the set, between the sky and the street corner where Usnavi lives, towers a silhouette of the George Washington Bridge – a physical siren song, calling the dreamers to stray from their cosy familiarity. This landmark links sky and street in a set so artful that I am compelled to refer the reader to the 1755 poaching of the renowned Dr. Cullen from the Faculty of Physicians and Surgeons of Glasgow. Further, I must state that the Footlights, in obtaining the services of Andrew McDivitt (a final year arts student at Weegie University) as Set Designer, have rendered a service to their fellow Edinbuggers of no less importance than Cullen’s installation in the medical faculty at Edinburgh – if they have paid for McDivitt’s return rail ticket, they should insist on tearing it up. Many of Usnavi’s customers are cabbies working for Kevin and Camila Rosario’s taxi company, located across the street. Kevin in particular carries a weight of aspiration. Through sheer hard work he has raised his family’s fortunes to the point where his beloved daughter, Nina, can attend Stamford and climb the Ivy League into realms he can only imagine. The Heights are abuzz when Nina’s returns. In her are stored many of the other locals’ hopes and dreams but she brings with her unsettling news which might unravel the industrious fabric of the community. Benjamin Aluwihare as Usnavi heads an exceptional cast. Lin-Manuel Miranda, the American composer, rapper, lyricist, and actor who wrote In The Heights would be thrilled to see his characters brought to life so vividly. This is a big company but space is found for every member to shine. The ensemble are magnificent – lively, well-drilled, fluid – they would have to be in order to frame the superb character work going on around them. It’s not just that Alex Poole captures Kevin’s arrogance without ever losing his pathos, or that Jordan Roberts-Lavery as Sonny is light without ever being thickly fluffy (think Fred Ewanuick in Corner Gas); Becki Clark brilliantly combines Vanessa’s carefreeness as well as her deeper longings and Aisling Brady uncannily inhabits the aged, matriarchal frame of Usnavi’s Abuela – what matters is that these talented team players can put two and two together and get five. The relationship between Kirsty Findlay’s Nina and Nitai Levi’s Benny is heartfelt and deeply moving. With so much work to do they still make the time to give and take, allowing each other room to manoeuvre and time to shine. If Elayne Gray brings the same patient goodwill to her role as Footlight’s Señorita Presidente as she does to that of Carla, then it’s not hard to imagine how this mind-blowing production came about. Aluwihare tells us he aspires to continue acting to a professional level. You need a new ambition mate. That one’s done and dusted. “Just ask yourself, does it do what it says on the tin?” It’s the best piece of advice a reviewer can have. 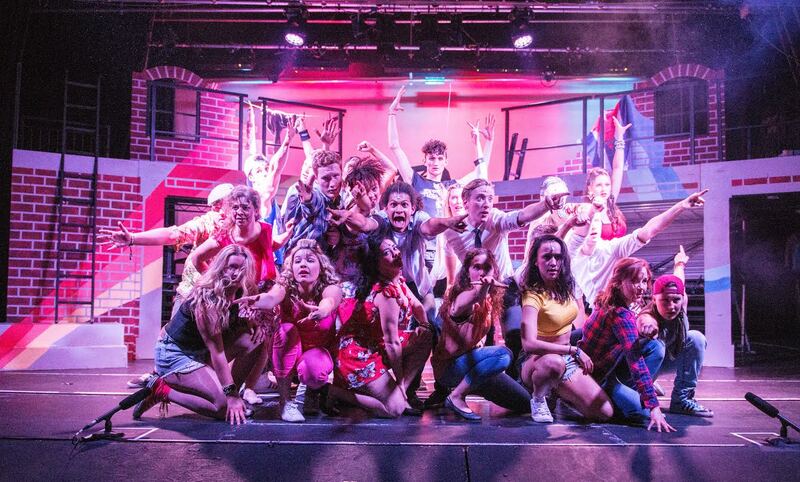 In The Heights is billed as a toe tappin’, all singing, all dancing extravaganza and by Jove it is that all right! The acoustics aren’t perfect, the sound levels aren’t totally adjusted – but I don’t care. No-less-so than the build, the soundscape is evocative of the pop-up Havana Club Bar under the David Hume Tower two Fringes back – bursting with life, energy and creative passion. I would like to own the CD of this production but that might not be practical for copyright reasons. What can be done, what needs to be done, what must be done, is to lock Dan Glover and his band permanently in George Square Gardens (there’s already a fence) so that everyone can feel like we felt hearing them play. The highest compliment about the music I can think up, is that it totally did justice to the set and performances. I am frequently told to go sit in the corner by colleagues affronted at my suggestion that the problem with musical theatre is that constantly touring productions get coated in layers of lacquer until they are rigid and brittle. I don’t know whether Footlight’s four night run of In The Heights proves or disproves my point. All I can say for certain is that Ronan Radin as Piragua Guy rests the case that we gents of a chunkier build can out awesome your backflipping, pirouetting, skinny-malinky long legs and steal even the biggest, brightest, brilliantest show you’re likely to see in Edinburgh before August. Visit In The Heights homepage here.